There are 3 things that are required in order to have a successful garden: seeds, soil, and fertilizer. Each bed can take 1 seed and 1 soil. A Deluxe Garden Patch with 8 beds will therefore hold up to 8 seeds and 8 soils. There are many different types of seeds, just ask a local botanist. Most of these seeds are not very useful since the plants are easy enough to gather by a botanist. Gardening should therefore be used to crossbreed for seeds that are rare to find or even impossible to obtain otherwise. The next important component of gardening is the soil. There exists three different types of soils, each with 3 different grades. The higher the grade, the more potent their effects. If you can gather or afford Grade 3 soils, then there is absolutely no reason to use Grades 1 or 2 of any soil type. The first and most useful type of soil is Thanalan Topsoil. Thanalan Topsoil increases crossbreeding chance and will be used 99 percent of the time. The second type is Shroud Topsoil, which is used to increase yield quantity. Shroud soil can be used to harvest more plants per seed and even more seeds per harvest (there are a few plants that Shroud soil will not increase plant/seed yield: Blood Pepper, Broombush, Glazenut, Jute and Thavnairian Onion). The final soil type is La Noscean Topsoil. It is used to increase the likelihood of obtaining high-quality plant yields, which can be useful for Culinarians interested in using HQ materials. A majority of the time, crossbreeding will be involved, so Grade 3 Thanalan Topsoil will be used the most. It can be obtained in Hammerlea, Western Thanalan, at 5AM Eorzea Time. The Topsoil Gathering page will give you a full list of when and where you can harvest all soils. Note that Grade 3 soils of any type can only be gathered by a miner with a minimum of 353 Gathering. A miner retainer can also be sent out on ventures to bring back topsoil as well. A successful garden also requires tending from time to time. An untended garden will lead to the loss of the plants. Plants need to be tended at least once a day to ensure that they are doing well, otherwise they will wither and die (a few higher tier plants will need tended more often). When a plant is ready to be harvested it will stay that way indefinitely so you can keep in the ground if you wish. You can also fertilize plants which will reduce grow times by approximately one Earth hour (with some exceptions). However, there is a limit to how much fertilizer you can use before it becomes ineffective. Please see the Fertilizer Analysis page for an in-depth discussion on the effects of fertilizer on plants. Now for the most interesting aspect of gardening. Crossbreeding is the mechanic of generating an otherwise unobtainable seed by planting two different types of seeds beside each other. It is the mechanic that allows us to plant seeds and harvest plants such as Royal Ferns, Blood Peppers, Chives, Glazenuts and more. When a plant is ready to be harvested, aside from the plant itself you may also find a crossbred seed. The linked screenshot shows some early crossbreeding pairs. Notice that some of the entries are in bold. They are of importance because they allow us to obtain a loop and harvest high tier seeds without going through a lengthy process to crossbreed for them again. For example by planting Glazenut Seeds with Apricots Kernels, we will harvest not only Glazenuts and Apricots, but also find some Glazenut seeds as well. At the moment, the higher tier seeds you can loop are Chives, Glazenuts, Broombushes, and Jutes. Refer to the Site Documentation to understand how to read the crossbreed data shown on the site. In most situations a single garden patch should only be used to crossbreed one specific seed. There are some exceptions which can be found on the Cross Diagrams page. Assuming we have a Deluxe Garden Patch, and therefore we have 8 beds, then only 4 of each seed in a crossbreed pair can exist in a patch. 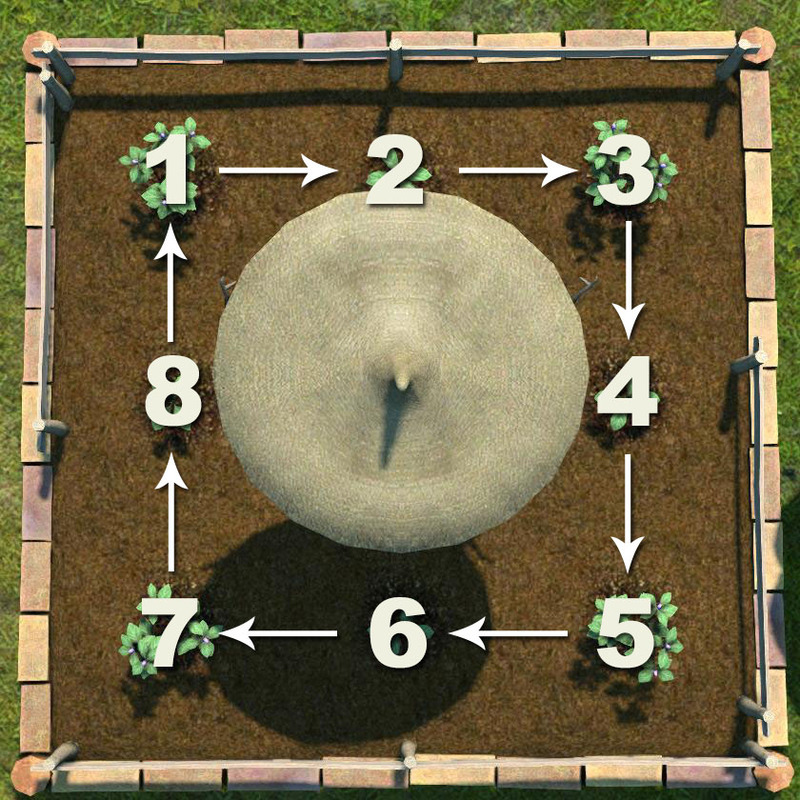 Shown in the image to the left is the ideal pattern for the planting of seeds in a Deluxe Garden Patch. Using Chives and Glazenuts as an example you will have Chive seeds in spots 1, 3, 5, 7 and Glazenut seeds in spots 2, 4, 6, 8. You will plant the first Chive seed in spot 1, then the Glazenut in spot 2 and alternate seeds all the way around. Crossbreeding occurs at the moment a seed is planted. That means the first seed that is planted will never yield a seed when it is ready to be harvested. If you want the first seed to yield something you can remove it after planting the other seeds in the bed and re-plant with the same seed. This will ensure you are getting a cross with the first seed as well. When done correctly, expect to obtain 4 to 8 crossbred seeds assuming you are using Grade 3 Thanalan soil for all spots. Different plants have different growing times; the higher the tier the longer it will take to grow. Take advantage of the fact that plants have different growing times. For example, Glazenuts take a much longer time to fully grow than Apricots. When the Apricots are ready to harvest, harvest them and replace them with more Apricot Kernels. These kernels will eventually yield Glazenut Seeds because at the time of planting there should already be Glazenuts growing beside them. The only time a bed should be empty is when the entire patch needs to be prepared to crossbreed a completely different seed. Otherwise, replacing plants as they are ready to be harvested will increase your rate of production. If all plants are ready to be harvested at the same time you can harvest the four plants of the same type and replant next to the other plants ready to be harvested. Doing so will allow the newly planted seeds to crossbreed with the harvestable plants. You can then harvest the remaining four plants and replant those seeds. Finally, it is good practice to ensure that there exists at least 4 of every seed in reserve. This ensures that in the event that something goes wrong, you will still be able to grow high tier seeds without having to start from the beginning.